The Chapel of the Garioch was a private Chapel in the Parish of Logie-Durno which had its church at Old Logie. This Church was in existence in 1151 and until 1583 was a parish Church: traces of the walls are still visible. When Christian Bruce, sister of King Robert, married one of his strongest supporters the King gave her as a dowry the Lordship of the Garioch. 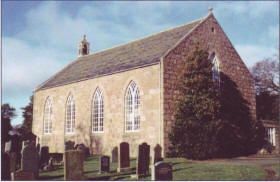 Around 1350 Christian founded and endowed the Chapel of our Lady of the Garioch on the heights of Drumdurno so that masses might be said for the souls of the Founder, her brother and her husband. So began the Chapel of the Garioch. By 1500, through endowments gifted by the Mar and Leslie families, five other priests were attached to this small but Royal Chapel. Mary Queen of Scots, during her stay at Balquhain Castle in September 1562, heard mass in the Chapel, a fitting close to its 200 years of aristocratic history. In 1583 it became the Church of the Parish of Logie-Durno. In 1599 the Presbytery decreed that the small Parish of Fetternear, long vacant, should be united with Logie-Durno and a new Church built for the joint Parish at the site of the Chapel of the Garioch. The walls of the old Chapel disappeared, but it gave its name to the new Church, called simply 'The Chapel', and through the Church to the new Parish. For long it was known as 'The Parish of Logie-Durno, commonly called the Chapel of the Garioch' until common usage won the day. The present Church, the same length as the old but almost twice as broad, was opened for worship in 1813. The form was the usual rectangle with narrow sides east and west; four pointed windows in the south wall with the pulpit between the two centre lights and round three sides a gallery entered from an external stair. In its latter days the walls were elaborately stencilled in various colours while the ceiling, painted blue, was spangled with gold stars. In 1922 it was extensively renovated by the Congregation. The back gallery was removed and a Chancel with a window of five lights was built out from the north wall. Pulpit and prayer desk, organ and Chancel furnishings were memorial gifts of the Pittodrie and Crowmallie families. In 1931 the Woman's Guild donated stained glass for the window and while the Church was being redecorated in spring 1959 a Memorial Mosaic Plaque was inserted in the Chancel wall. Chapel is an extremely interesting example of what can be done with the usual heritors' building of 1750-1850 and today it is one of the most beautiful of our country Churches.